First of all, Happy New Year everyone! I have been absent this blog because of my work on a project I'm creating called "Singing In The Studio". It's a labor of love and a compilation of information and vocal strategy from a lifetime of recording. I'll let you know when it's (whew!) done... Meanwhile, let's talk about your singing hands. The hands of a singer (hey, or a speaker) make an interesting study for me. Personally, if you were to make me freeze my hands in place, I don't think I could sing- or talk! Years ago, a studio engineer in Memphis told me to stand perfectly still at the mic. This guy was NOT a singer and therefore trying to explain how stiffness affects the voice was falling on deaf ears. I did as he asked, and sure enough my tone was dead, my performance numb, my vocal range limited. Thank goodness I knew to ignore that advice from that time on. Consider the traditional hands-clasped-in front-position used by classical singers. Now visualize the "smooth-move" hands of a hip hop artists such as Usher. Next think about the expressive hands of a pop vocal diva such as Celine Dion. Now the subtle hand-speak of an R&B icon like Aretha Franklin or the sultry hand moving of jazz singer Jane Monheit. Read the message given by the hands of gospel singer Cece Wynin; remember Christina Agulera singing "This Is A Man's World" on the Grammys a few years ago. Think about the conversational hand-talk in performances by Garth Brooks and Faith Hill. Lastly, remember the incredible performances of Michael Jackson in the recent show they pieced together for "This Is It". In different ways, they are all doing the same thing. All these vocalists are using their hands to help with their breath control and to keep their throats open... whether they know it or not! What about you -- do you use your hands when you sing? As a guitarist singer songwriter -- virtually all my performances are with an acoustic guitar in my hands. 30 years ago -- I was aware of a huge difference in performances in small venues that did not require mics -- compared to my performances in larger venues requiring mics. The need for at least one mic and usually two mics "anchored" me in place and prevented much movement of any kind. Over the last 10-15 years or so, I have had the blessing of a cordless plug-in for my guitar -- which has given me much more freedom of movement -- but still anchored me to the vocal mic. The two or three times I have been able to "wear" a cordless vocal mic were the best experiences I have had in large venues because it most closely approximates the freedom of movement I like in the small intimate venues -- like house concerts and such. Most of the venues I circulate through are churches and small to medium places where a "good" wearable cordless mic is not an option. 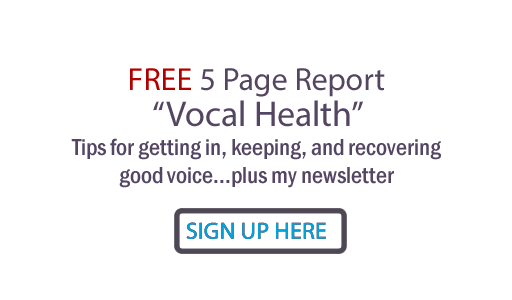 Reading your thoughts gives me additional reasons to consider the personal investment in a high quality wearable cordless vocal mic that I can provide to the venues I sing in that require amplification. Thanks for the read... I hope these thoughts and comments of mine are relevant and/or useful to you and/or your readers. Van that is great information indeed... and the 'wearable' cordless mic does anchor you psychologically even while freeing you physically. Isn't it amazing how the body and voice like to dance together in specific ways? Thanks for your comment, much appreciated!